Recycling and reuse of refined wastewater for industrial and agricultural uses can largely prevent water loss. This requires strict and principled purification of the sewage. The treatment of wastewater depends on the source of the wastewater (industrial or domestic) production, in which different wastewater treatment processes are used. The growing analysis of surface water and groundwater resources in the country and the reduction of rainfall in recent years have required the use of water recycling methods to be more colorful than ever before. In addition, the drainage industrial, sanitary and agricultural wastewater into water resources has contributed to the pollution and destruction of limited water resources in the country and has exacerbated the dehydration and dehydration crisis. To overcome the drought crisis, water management and water recycling need to be taken into account much more than before. The implementation of modern irrigation systems in the agricultural industry and the reuse of wastewater are among the effective ways of coping with the depression crisis. The use of a water recycling package is also one of the most modern and cost effective methods in this regard. With the use of world-class technologies, Farab Zist Faraz Co. has been manufacturing all types of recycling and wastewater treatment packages for recycling and reuse of wastewater for various uses. Output waste from these packages can be used for a variety of uses including greening, washing, and so on. The MBR process is one of the most advanced and best processes for waste recycling and reuse. This process is a combination of biological process and membrane filtration. The output quality of this process in most cases is such that it can be reused without the use of additional refinement. 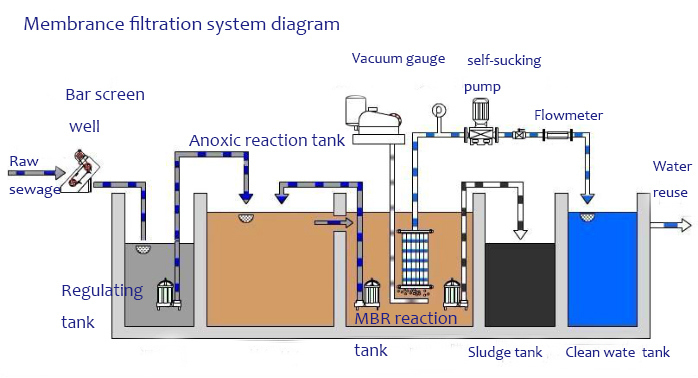 The MBR treatment process is one of the biological processes of sewage treatment, consisting of a combination of conventional activated sludge process with a submerged membrane system. 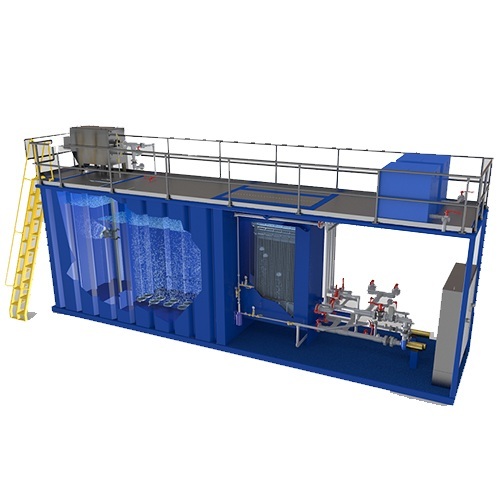 This process replaces conventional processing (conventional sludge) by integrating aeration units, secondary settling (clearing) and filtration in a reactor. 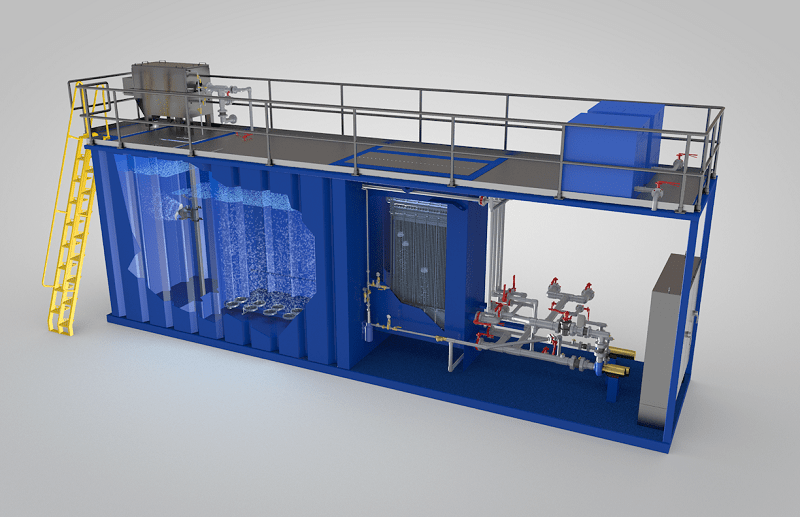 In this process, by replacing the secondary settling unit with the membrane filtration system, many benefits are obtained, such as increased stability in operation, reduced sludge production and a much higher output waste quality. Therefore, this method is a suitable process that can be used in a wide range of reused wastewater treatment systems for the treatment of sanitary and industrial wastewater. Farab Zist Faraz Engineering Co. is using modern technologies in designing and manufacturing various types of water recycling packages. The optimal use of space, the maximum cleaning efficiency, and the minimum need for guidance and maintenance along with compliance with the EPA standards are among the features of the company’s water recycling systems. Please contact us for more information regarding details, prices and calculation of the capacity of the recycling water packaging.